Traditional Custom Plastic Bags – Low 250 Bag Minimum! These Durable Printed Plastic Shopping Bags feature your logo hot-stamped on one side of the bag using standard colors or a lustrous metallic foil. The metallic foil creates an attention-grabbing, attractive, and upscale look for your brand. 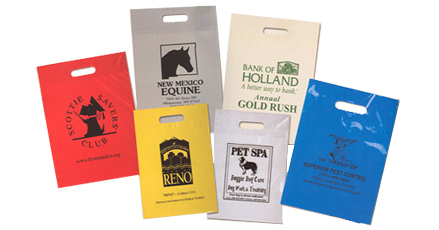 Seven different size Custom Plastic Bags are available, ranging from 9" x 12" to 15" x 18". You can choose from nine colors for your Printed Plastic Bags: Blue, Ivory, Red, Gray Yellow, Pink, Green, Clear, Orange, and Black. Twelve stylish imprint colors are also available for your Custom Plastic Shopping Bags, such as Metallic Blue, Metallic Blue, Metallic Red, and Metallic Silver. FS9X12GB 9"x 12" Grab Bag 0.91 0.77 0.73 0.71 6" 7"
FS11X15GB 11"x 15" Grab Bag 1.08 0.89 0.86 0.84 7½" 8"
FS9X13TH 9"x 13" Take Home Bag 0.94 0.79 0.77 0.75 6" 7"
FS11X15TH 11"x 15" Take Home Bag 1.09 0.90 0.87 0.85 7½" 8"
FS15X18TH 15"x 18" Take Home Bag 1.76 1.02 0.98 0.95 10" 8"
FS11X15PH 11"x 15" Patch Handle Bags 1.19 0.99 0.96 0.93 7½" 8"
FS15X18PH 15"x 18" Patch Handle Bags 1.36 1.10 1.06 1.03 7½" 8"
P11X15Tx1 11"x 15" Take Home Bag 0.77 0.58 0.55 0.54 8" 10"
P15X18Tx1 15"x 18" Take Home Bag 0.94 0.70 0.66 0.64 11" 12"
with Gusset 0.81 0.63 0.59 0.55 8" 8"
with Gusset 0.97 0.74 0.70 0.65 11" 11"
It's easy to get started with you Custom Plastic Bags. Simply contact us at 1-800-233-0828 and submit your camera-ready artwork to graphics@kardwell.com (you can also mail your art). You will receive your Printed Plastic Bags in about 3 weeks. Rush delivery is available. For more information on our Custom Printed Plastic Shopping bags, please contact us at 1-800-233-0828.